Polymorphonuclear leukocyte (PMN) migration across the intestinal epithelium closely parallels disease symptoms in patients with inflammatory bowel disease. PMN transepithelial migration (TEM) is a multistep process that terminates with PMN detachment from the apical epithelium into the lumen. Using a unique mAb (GM35), we have previously demonstrated that engagement of the CD44 variant containing exon 6 (CD44v6) blocks both PMN detachment and cleavage of CD44v6. In this article, we report that PMN binding to CD44v6 is mediated by protein-specific O-glycosylation with sialyl Lewis A (sLea). 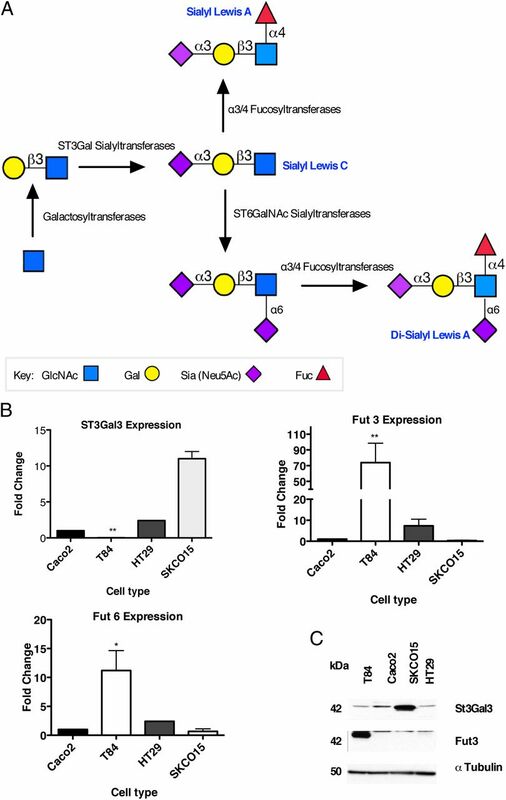 Analyses of glycosyltransferase expression identified fucosyltransferase 3 (Fut3) as the key enzyme driving sLea biosynthesis in human intestinal epithelial cells (IECs). Fut3 transfection of sLea-deficient IECs resulted in robust expression of sLea. However, this glycan was not expressed on CD44v6 in these transfected IECs; therefore, engagement of sLea had no effect on PMN TEM across these cells. Analyses of sLea in human colonic mucosa revealed minimal expression in noninflamed areas, with striking upregulation under colitic conditions that correlated with increased expression of CD44v6. Importantly, intraluminal administration of mAb GM35 blocked PMN TEM and attenuated associated increases in intestinal permeability in a murine intestinal model of inflammation. These findings identify a unique role for protein-specific O-glycosylation in regulating PMN–epithelial interactions at the luminal surface of the intestine. The migration of polymorphonuclear leukocytes (PMNs) out of the circulation across both endothelial and epithelial cell barriers is critical to the host inflammatory response to infection and injury. When dysregulated, the influx and accumulation of PMN in intestinal crypts is also a hallmark of the symptomatic phase of many intestinal inflammatory processes, including Crohn’s disease and ulcerative colitis (UC) (1, 2). Considerable progress has been made in understanding the steps involved in PMN trafficking across vascular endothelium (3–5) and intestinal epithelium (6–9). In addition, the mechanisms governing late events in PMN transmigration across mucosa, including PMN detachment and release from the apical surface of epithelia into the lumen, although incompletely characterized, have become a recent focus of investigation. 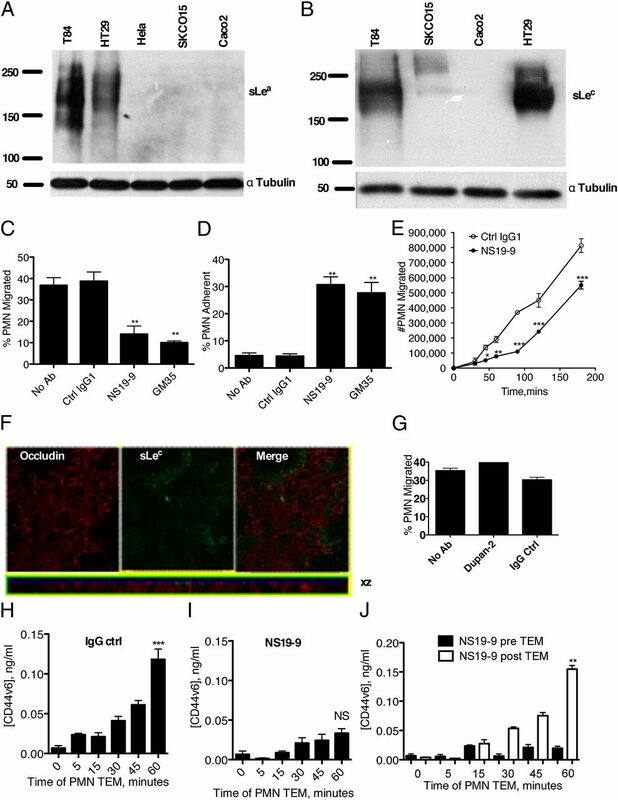 It has been previously reported that epithelial ICAM-1 is expressed apically and acts as a PMN retention ligand under inflammatory conditions (8). In addition, PMN FcR interactions with apical epithelial proteins have also been implicated in PMN–epithelial retention (10), and it has previously been reported that decay-accelerating factor functions as an antiadhesive epithelial glycoprotein that regulates PMN detachment from the epithelium (11). As described later, we recently reported that a CD44 variant containing exon 6 (CD44v6) regulates detachment of migrating PMN from the apical epithelial surface into the intestinal lumen (12). CD44 represents a heterogeneous, though monogenic (13), group of cell-surface glycoproteins implicated in multiple cellular functions including, but not limited to, cell–cell adhesion (14), cell migration (15), and cell matrix adhesion (16). The amino-terminal globular domain of CD44 proteins is separated from the transmembrane domain by a short-stem structure that contains putative proteolytic cleavage sites (17). This stem structure can be extended by the insertion of CD44 variant exons, causing the large variant isoforms of CD44, the expression of which is restricted to rapidly dividing cells including epithelial cells, activated lymphocytes, and some tumor cells (18–20). The extracellular domains (ECDs) of CD44 variant proteins are known to contain motifs for posttranslational modifications including numerous sites for N- and O-linked glycosylation (21). CD44 protein diversity is therefore generated both by alternative splicing of variant exon-encoded gene products in the membrane-proximal ECD region (22) and by cell-type–specific differences in glycosylation (23, 24). One such variant is CD44v6, for which we developed a specific mAb (GM35). Using this mAb, we recently described a role for shedding of the ECD of CD44v6 in PMN detachment from the surface of the apical epithelium (12). Despite the highly glycosylated nature of CD44 variant isoforms, the role of specific glycosylation motifs in the function of these important proteins has yet to be characterized. In this study, we investigated factors regulating PMN release from the apical epithelium. We show that, during inflammation, PMN detachment from the apical surface of the intestinal epithelium is regulated by glycan epitopes present on CD44v6. We demonstrate that the functionally inhibitory effects of the O-glycan–binding mAb GM35 are meditated through sialic acid–dependent binding to sialyl Lewis A (sLea) specifically expressed on CD44v6, and that sLea synthesis is α3/4 fucosyltransferase 3 (Fut3)–dependent. Analyses of sLea and CD44v6 in human colonic mucosa revealed expression that was restricted to regions of active inflammation. Inhibitory effects of mAb GM35 on PMN transepithelial migration (TEM) were confirmed in an in vivo model of intestinal inflammation, where blockade of PMN TEM also prevented PMN-dependent increases in intestinal permeability. Cultures of T84 (25), HT29 (26), Caco2 (11), and SKCO15 (27) intestinal epithelial cells (IECs) were grown as previously described. Monoclonal anti-CD44v6 Ab was purchased from R&D Systems (Minneapolis, MN). Monoclonal anti-desmoglein mAb was purchased from Santa Cruz Biotechnology (Santa Cruz, CA). Monoclonal anti-sLea Ab (NS19-9) was purchased from Dako (Carpinteria, CA). Anti–sialyl Lewis X (anti-sLex) mAb (CD15s) was purchased from BD (Franklin Lakes, NJ). The anti–sialyl Lewis C (anti-sLec) mAb (Dupan-2) was purchased from Glycotech Corporation (Rockville, MD). Anti-Fut3 mAb was purchased from Abcam (Cambridge, MA). mAb GM35 was isolated as described previously (12). The anti-CD11b/CD18 mAb CBRM1/29 has been described elsewhere (28). Abs against Siglec-5, Siglec-9, and Siglec-14 were purchased from Abcam (Cambridge, MA) and BD Bioscience (San Jose, CA). Protein G-Sepharose beads were purchased from GE Healthcare Life Sciences (Pittsburgh, PA). Zenon Alexa Fluor 488 Mouse IgG1, 568 Mouse IgG1, and 568 Mouse IgG2b labeling kits were purchased from Invitrogen (Carlsbad, CA). BSA, chemotactic peptide fMLF, ABTS, 2-acetamido-2-deoxy-α-d-galactopyranoside, iodoacetamide, guanidinium chloride, streptavidin, DTT, and neuraminidase from Arthrobacter ureafaciens were purchased from Sigma-Aldrich (St. Louis, MO). Tunicamycin was purchased from Calbiochem (La Jolla, CA). Kifunensine was purchased from EMD Chemicals (Newark NJ). N-glycosidase F/PNGase-F was purchased from New England Biolabs (Ipswich, MA). Full-length CD44 in a pCMv6 entry vector plasmid, CD44-specific short hairpin RNA (shRNA) constructs, and a Scr construct plasmid in pGFP-V-RS vectors and Fut3 and Scr siRNA duplexes were purchased from Origene (Rockville, MD). Human CD44var6 (CD44v6) instant ELISA kits were purchased from Bender Medsystems (Vienna, Austria). SYBR green supermix was purchased from Bio-Rad (Hercules, CA). T84 or HT29 IECs cells were grown in the presence or absence of tunicamycin at 5 μg/ml in complete medium for 24 h at 37°C to block N-glycosylation. To block O-glycan extension, we incubated cells with 5 mM benzyl GalNAc in complete media for 24–48 h at 37°C. For removal of sialic acid, T84 and HT29 IEC protein lysates were treated with neuraminidase overnight at 4°C according to manufacturer’s instructions. Abs were submitted for glycan binding analysis to the Consortium for Functional Glycomics (CFG; http://www.functionalglycomics.org), GM35 (cfg_rRequest_2785, pa_v5), at 0.1 μg/ml, and the anti-sLea Ab NS19-9 (cfg_rRequest_1982, pa_v41) and the anti-sLec Ab Dupan-2 (cfg_rRequest_2614, pa_v51) at 10 μg/ml. 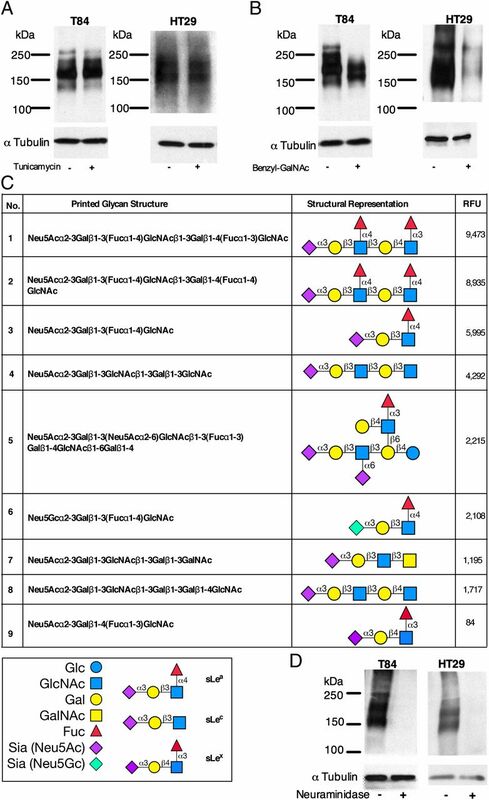 These glycan microarrays contain up to 611 individual structures, representing a library of known natural and synthetic mammalian glycans, in replicates of six. Binding of Abs to specific glycan epitopes was detected using fluorescently labeled secondary Abs. An relative fluorescence unit ≥500 was set as a threshold indicative of positive binding. PMNs were isolated from whole blood obtained from healthy volunteers, with approval from the Emory University Institutional Review Board on human subjects, by using a previously described density gradient centrifugation technique (29). PMNs were resuspended in HBSS with 10 mM Hepes, pH 7.4, and without Ca2+ or Mg2+ at a concentration of 5 × 107 cells/ml. Neutrophils isolated in this way were 97% pure and >95% viable, and were used for transmigration within 2 h of blood draw. For transmigration experiments, IECs were grown on collagen-coated, permeable, 0.33-cm2 polycarbonate filters (5-μm pore size; Costar) as described previously (9, 25, 30). All epithelial migration experiments were performed in the physiologically relevant basolateral-to-apical direction (i.e., inverted monolayers), in the presence of a chemotactic gradient of 100 nM fMLF. For migration experiments, 1 × 106 PMNs were added to the upper chambers of transwell inserts, and migration was measured at 37°C for indicated times in the presence of 10 μg/ml apically applied GM35, NS19-9, Dupan-2, or isotype control mAb. For analysis of effects of sialic acid–binding Ig-type lectins (Siglecs) on the GM35-mediated blockade of PMN TEM, PMNs were preincubated with 10 μg/ml Abs against Siglec-5, Siglec-9, and Siglec-14 for 20 min before the initiation of PMN TEM. Transmigrated PMNs were quantified by assaying for the PMN azurophilic marker myeloperoxidase (MPO) as described previously (31). PMNs, which migrated through tight junctions, yet remained adherent to the apical surface of the T84 IEC monolayer after basolateral-to-apical migration, were quantified using a previously described procedure (10). In brief, after completion of transmigration, T84 monolayers were removed and transferred to new tissue culture plates containing 1 ml HBSS/well. Plates were spun for 5 min to release PMNs that had migrated through junctions yet remained adherent to the apical surface (50 × g, 4°C). Detached PMNs were quantified by MPO assay as described earlier. PMNs were isolated and stimulated to migrate across confluent T84 monolayers in the physiologically relevant basolateral-to-apical direction in the presence or absence of apically applied NS19-9 (10 μg/ml), as described earlier. Samples from the apical reservoir were removed at 0, 5, 15, 30, 45, and 60 min and assessed for levels of soluble CD44v6 (sCD44v6) using a CD44v6 ELISA kit according to manufacturer’s instructions. A standard curve was prepared from six standard dilutions of sCD44v6, and levels of sCD44v6 in experimental samples and standards were measured at 450 nm. Cell lysates for immunoblotting were prepared with the following lysis buffer (20 mM Tris, pH 7.5, 150 mM NaCl, 1 mM EDTA, 1% TX-100, 1 mM Na3VO4, and 1 mM PMSF) supplemented with 10% mammalian tissue protease inhibitor mixture (Sigma-Aldrich). For immunoprecipitation experiments, precleared cell lysates were incubated with 2 μg relevant mAb for 4 h at 4°C, followed by incubation with protein G-Sepharose beads overnight at 4°C. Washed immunoprecipitates and regular cell lysates were boiled in SDS-PAGE sample buffer under reducing conditions and then subjected to SDS-PAGE followed by transfer to PVDF under standard conditions. Membranes were blocked with 4% milk and incubated with 1 μg/ml of the indicated mAb. Primary Abs were detected using appropriate HRP-linked secondary Abs (Jackson Immunoresearch Laboratories, West Grove, PA). Murine small-intestine and colonic mucosal epithelial lysates were prepared after the serosa and external longitudinal layer of the muscularis propria were stripped away. Isolated mucosal sheets were solubilized in SDS sample buffer and analyzed for protein expression by immunoblot using indicated Abs. Primary Ab binding was detected with relevant HRP-conjugated secondary Ab (CD44v6) or with HRP-labeled streptavidin for biotinylated GM35. Human IECs (T84, SKCO15, and Caco2) were processed first by adding 8 M guanidinium HCL in 0.2 M Tris (pH 8.2). Proteins were then denatured by DTT and alkylated by iodoacetamide. Denatured samples were dialyzed against water overnight before lyophilization was performed. Lyophilized proteins were subsequently digested with trypsin in 50 mM phosphate buffer (pH 8.2) to generate glycopeptides that were susceptible to digestion with N-glycosidase (PNGase F). After PNGase F digestion, released N-glycans were obtained from the run-through of C-18 cartridges and collected by elution followed by subsequent application to a Carbograph cartridge. Remaining peptides and glycopeptides containing the O-glycans were obtained by elution with 80 and 100% methanol from the C-18 cartridge. O-linked glycans were released by sodium hydroxide–mediated reductive β-elimination (50 mM NaOH, 1 M NaBH4) at 45°C for 16 h. Released O-glycans were obtained in the run-through of C-18 cartridges and collected by elution from a subsequent application to a Carbograph cartridge. N- and O-glycans were permethylated by sodium hydroxide and iodomethane in DMSO to allow for further structural analysis. Reactions were quenched by double-distilled H2O (ddH2O) after 1 h, and the samples were extracted by chloroform before further washing with ddH2O. The chloroform fraction was gently dried by nitrogen gas and redissolved in a 1:1 mix of methanol and ddH2O. The samples were loaded onto a C-18 cartridge and eluted stepwise with ddH2O and 15, 35, 50, and 75% aqueous acetonitrile. Permethylated glycans were usually present in the 35, 50, and 75% acetonitrile fractions. An Ultraflex-II TOF/TOF system (Bruker Daltonics, Fremont, CA) was used for MALDI-TOF mass spectrometry (MS) analysis. Reflective positive modes were used as indicated in the figures. The 2,5-dihydroxybenzoic acid (5 mg/ml in 50% acetonitrile, 0.1% TFA) was freshly prepared to use as the matrix. A 0.5-μl matrix solution was spotted onto an Anchorchip target plate (200 or 400 μm) and air-dried before 0.5 μl sample solution was applied and also allowed to air-dry. The MS/MS data were acquired in positive reflector mode using an Applied Biosystem MALDI-TOF/TOF 4800 plus (Applied Biosystems, Foster City, CA). The collision energy was set to 2kV, and argon was used as collision gas. Data were acquired using the 4000 Series Explorer Instrument Control Software and were processed using Data Explorer MS processing software (Applied Biosystems). MS/MS spectra were assigned and annotated with the help of the GlycoWorkbench tool from EuroCarbDB (http://www.eurocarbdb.org). PMNs were isolated as described earlier and incubated with GM35 (10 μg/ml), NS19-9 (10 μg/ml), anti-sLex mAb (10 μg/ml), anti-CD44v6 mAb (10 μg/ml), or the anti-CD11b/CD18 mAb CBRM1/29 (10 μg/ml). After washing, PMNs were incubated with a FITC-labeled secondary Ab, fixed in 2% PFA, and analyzed by flow cytometry. Flow cytometric analysis was carried out using a FACScan (Becton Dickinson, Franklin Lakes, NJ) equipped with an argon ion laser tuned at a 488-nm wavelength. Immunofluorescent labeling of IECs was achieved as follows. Nonpermeabilized T84 monolayers were fixed using absolute ethanol and subsequently blocked with 3% BSA. Monolayers were then incubated with Zenon Alexa Fluor–labeled primary Abs (10 μg/ml) or with primary Abs and fluorescently labeled secondary Abs. After Ab incubations, monolayers were mounted in ProLong antifading embedding solution (Invitrogen Life Technologies, San Diego, CA). Images shown were representative of at least three experiments with multiple images taken per monolayer. For human tissue staining, frozen sections (6 μm) of discarded resection specimen colonic mucosa from patients with UC were obtained. Inflamed and noninflamed sections of discarded tissue were characterized based on observed extent of disease activity. Tissue was fixed in absolute ethanol, nonspecific protein binding was blocked with 3% BSA, and tissue sections were incubated with primary Abs, washed in HBSS+, and subsequently labeled with appropriate secondary Abs or with Zenon Alexa Fluor–labeled primary Abs (10 μg/ml). Nuclei were stained with TO-PRO-3 iodide (1:1000 × 5 min, room temperature; Invitrogen Life Technologies, San Diego, CA). For immunohistochemistry, tissue sections were incubated with GM35 at 10 μg/ml followed by hematoxylin and eosin staining to detect primary Ab binding. All procedures on discarded human tissue were carried out under Emory University Institutional Review Board approval. All images were captured using an LSM 510 confocal microscope (Carl Zeiss Microimaging, Thornwood, NY) with pan-Neofluor 40×/1.3 oil objective using software supplied by the vendor. Human IECs were lysed in TRIzol (Invitrogen Life Technologies, San Diego, CA), then subjected to phenol-chloroform extraction according to the manufacturer’s protocol as described previously (32). RNA was digested with DNase I (Ambion, Austin, TX) to remove contamination with genomic DNA; then cDNA was synthesized by reverse transcription using oligo(dT12–18) primers and SuperScript II reverse transcriptase (Invitrogen, Grand Island, NY). Real-time PCR was performed using a MyIQ real-time PCR machine and SYBR Green supermix (BioRad, Hercules, CA). Data were analyzed by the ΔΔCt threshold cycle method and normalized to the housekeeping gene GAPDH as previously described (33). Male wild type (WT) C57BL/6J mice (Jackson Laboratories) were maintained under specific pathogen-free conditions at Emory University Division of Animal Resources facilities. After overnight fasting, animals aged between 11 and 15 wk were anesthetized by s.c. i.m. injection of a mixture of 100 mg/kg ketamine and 5 mg/kg xylazine. Next, a midline abdominal incision was made and a 4-cm loop of small intestine was exteriorized and ligated at both proximal and distal ends (Fig. 7B). For PMN migration experiments, isolated intestinal loops were injected with 100 μM fMLF or 500 ng of the PMN chemoattractant CXCL1 (KC), ± 50 μg indicated mAb, in 200 μl HBSS+ followed by loop reinsertion into the peritoneal cavity. The abdomen was then sutured closed, and the animal was monitored for a 90-min incubation. Mice were then euthanized via rapid cervical dislocation, and the abdomen was reopened. Intestinal loops were isolated and lavaged twice with HBSS+. The number of PMNs reaching the intestinal lumen was quantitated based on cytospin analysis and Diff-Quik staining of the lavage fluid (Dade Behring, Newark, DE). For dextran flux assays, isolated intestinal loops were injected with 100 μM fMLF and indicated Abs (50 μg GM35 or IgG control mAb) before reinsertion into the anesthetized mice for a 60-min incubation. After the initial incubation, FITC-dextran (10 kDa, 1 mg/ml in 200 μl saline) was injected into the intestinal loop, and mice were monitored for an additional 30 min. Passage of dextran out of the intestine into the vasculature was assessed through the measurement of fluorescence in peripheral blood (obtained through cardiac puncture) using the Fluostar Galaxy plate reader (BMG LabTech, Germany). After cardiac puncture, mice were euthanized via rapid cervical dislocation. PMNs were depleted as previously described (34) to assess the role of PMN influx in the observed changes in barrier permeability after introduction of fMLF to the lumen of the murine small intestine. In brief, anti-Ly6G Ab (200 μg/mouse) was injected into the i.p. cavity of mice 24 h before exteriorization of the small intestine loop and dextran flux assay, as described earlier. All animal protocols were reviewed and approved by the Institutional Animal Care and Use Committee of Emory University. Statistical differences were determined by two-factor ANOVA using PRISM 5 for Mac OSX version 5.0a 1992–1998, GraphPad software. Values are expressed as the mean and SE from at least three separate experiments. Closely regulated PMN translocation into the intestinal lumen is a crucial part of a successful host response to infection and injury. However, dysregulation of PMN influx into the intestinal tissues is also indicative of inflammatory bowel disease (IBD). In studies to characterize surface molecules that regulate PMN TEM, we generated a unique mAb (GM35) that blocks PMN trafficking into the intestinal lumen through binding to an epitope on the apically expressed epithelial protein CD44v6 (12). CD44v6 is a high m.w. member of the widely distributed type I transmembrane CD44 family of glycoproteins. Previous reports have indicated that the ECDs of CD44 variant proteins, including CD44v6, are extensively posttranslationally modified to contain N- and O-glycans (13, 21). To determine whether the functional effects of CD44v6 engagement were mediated specifically through glycan binding, we exposed T84 and HT29 IECs, previously shown to express the GM35 epitope, to glycosylation inhibitors before cell lysis and analysis of Ag expression by immunoblot. Pretreatment of these IECs with the inhibitor of N-glycosylation, tunicamycin (Fig. 1A), or the inhibitor of complex-type N-glycan formation, kifunensine (data not shown), had no effect on expression of the GM35-binding epitope on CD44v6. In contrast, treatment with benzyl-GalNAc, a small, synthetic sugar analog that competitively inhibits the terminal glycosylation of core 1-O-glycans and subsequent downstream formation of core 2-O-glycans (35), significantly reduced the level of epitope detection by GM35 in T84 and HT29 IECs (Fig. 1B). These findings are consistent with prior reports indicating that the glycans on the extracellular variant exon-encoded regions of CD44 proteins are predominantly O-linked (21). GM35 binds to the O-linked glycan sLea. T84 or HT29 IECs were pretreated with (A) 5 μg/ml tunicamycin or (B) 4 mM benzyl-GalNAc before whole-cell lysis and Western blotting with GM35. Data represent n = 3 immunoblots. (C) The glycans recognized by GM35, including glycan number, glycan structure, glycan name, and relative fluorescence units (RFU) intensity, are depicted with sLex included as a negative binding control. (D) Protein lysates from T84 or HT29 IECs were treated with 50 U neuraminidase before whole-cell lysis and Western blotting with GM35. Data represent n = 3 immunoblots. To both confirm the specificity of GM35 for a carbohydrate ligand and further characterize the glycoepitope recognized by this mAb, we analyzed the affinity of GM35 binding to specific glycan determinants on a glycan microarray developed by the CFG. These glycan arrays contain immobilized glycans, representing a variety of known glycan structures presented on both N- and O-glycan backbones, as described in Materials and Methods. The results show that GM35 binds strongly to each of three glycans containing the tetrasaccharide determinant Neu5Acα2-3Galβ1-3(Fucα1-4)GlcNAc-R (Fig. 1C). This glycan determinant is composed of four monosaccharides, N-acetylneuraminic acid (Neu5Ac; sialic acid), galactose (Gal), fucose (Fuc), and N-acetylglucosamine (GlcNAc), and represents the human blood group Ag sLea. Further analysis revealed almost equivalent binding of GM35 to sLea as a component of the extended structures sLea-sLex (Glycan 1) and sLea-sLea (Glycan 2), with weaker binding to the sLea tetrasaccharide alone (Glycan 3; Fig. 1C). In addition to these strong interactions with sLea-containing glycans, microarray analysis also revealed weaker binding of GM35 to a variant form of sLea containing N-glycolylneuraminic acid (Neu5Gc), a derivative of Neu5Ac not normally synthesized in humans, but which has been reported to be present in certain cancers (36). It was also interesting to note that GM35 recognized sLea with both high affinity and specificity, in that GM35 showed no reactivity to glycans on the array terminating in its structural isomer, sLex (Neu5Acα2-3Galβ1-4[Fucα1-3]GlcNAc; Glycan 9; Fig. 1C). Glycan binding analysis also revealed lower affinity recognition by GM35 of the nonfucosylated sLea precursor, so-called sLec (Neu5Acα2-3Galβ1-3-GlcNAc; Glycans 4, 5, 7, 8; Fig. 1C). mAbs against sLea and sLec are commercially available with anti-sLea mAbs commonly used to screen for tumors of intestinal, hepatic, and pancreatic origin (37). Therefore, as a positive control for glycan recognition specificity, glycan microarray analyses of the anti-sLea mAb NS19-9 (38) and the anti-sLec mAb Dupan-2 (39) were performed. Results confirmed the specific binding of mAb NS19-9 to the tetrasaccharide sLea (Supplemental Fig. 1A). Furthermore, the three sLea-containing glycans recognized with the highest binding by GM35 were identical to those recognized most avidly by mAb NS19-9. In addition, glycan array analyses revealed that mAb Dupan-2 bound specifically to two sLec variant glycans (Supplemental Fig. 1B) that contained the three sLec constituent sugars in the same conformation as the sLec glycan structures recognized by GM35 (Fig. 1C). Although sLea in its entirety is common to the glycans binding GM35 with highest affinity, all the glycans, even those recognized by GM35 with lower affinity, contain a terminal sialic acid residue linked to Gal by an α-2-3 linkage. To further characterize the GM35 carbohydrate binding interaction, we examined the role of the terminal sugar residue Neu5Ac. Removal of Neu5Ac from IEC protein lysates by neuraminidase treatment resulted in a complete ablation of GM35 binding, suggesting a crucial role for this sugar moiety in the binding of GM35 to its primary target sLea (Fig. 1D). Having identified the role of (GM35 binding) sialylated epithelial epitopes in PMN TEM, we next wanted to investigate candidates for the PMN sialic acid binding receptor responsible for the GM35-mediated blockade of PMN TEM (12). Therefore, the potential contributions of the known PMN-expressed sialic acid–binding Ig-type lectins (Siglec-5, -9, -14) (40) to the GM35-mediated block of PMN TEM was assessed. 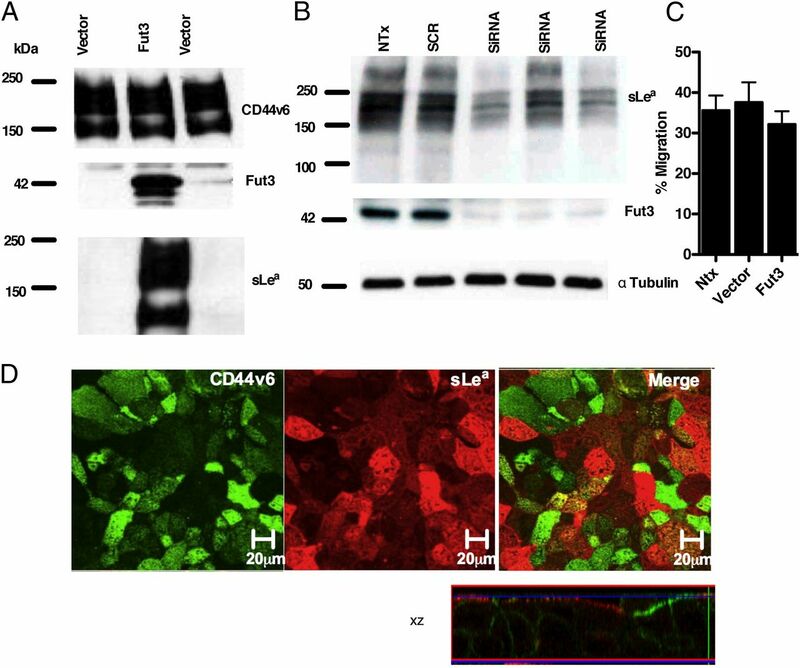 Preincubation of PMNs with functionally active Abs against Siglec-5, -9, and -14 (41, 42) had no significant effect on the GM35-mediated block in PMN TEM (Supplemental Fig. 1C). These findings suggest that previously reported PMN-expressed Siglecs are unlikely to be the counterligand(s) for the sialylated binding epitope recognized by GM35 on intestinal epithelium. We have previously demonstrated that the GM35 binding epitope is not expressed on the surface of PMNs (12), and thus its effects on PMN TEM must be mediated through specific interactions with the epithelium. Furthermore, immunoblotting analyses confirmed variations in IEC line expression of sLea, as detected by mAb NS19-9. A large sLea+ glycoprotein of a similar size to the protein recognized by GM35 (12) was detected by mAb NS19-9 in both T84 and HT29 IECs, but not in SKCO15 or Caco2 cells (Fig. 2A). Consistent with these findings, neither NS19-9 nor GM35 had any effect on PMN TEM across Caco2 monolayers (data not shown). This cell-specific pattern of expression for sLea is consistent with our prior observations for the GM35 Ag (12). In contrast, sLec was expressed by T84, HT29, and SKCO15, but not by Caco2 IECs (Fig. 2B). Interestingly, whereas T84 and HT29, but not Caco2, cells are known to independently express CD44v6 and sLea (43–45), the relationship between these two entities has not been previously studied. mAb NS19-9, but not Dupan-2, blocks PMN TEM and CD44v6 shedding. Indicated cells were lysed and proteins immunoblotted with NS19-9 (A) or Dupan-2 (B). Confluent T84 monolayers were pretreated with 10 μg/ml NS19-9, 10 μg/ml GM35, or 10 μg/ml noninhibitory IgG1 isotype control mAb before 1 × 106 PMNs were added to the basolateral surface. PMNs were allowed to migrate for 1 h in response to a 100-nM gradient of fMLF. The number of migrated PMNs (C) and the number of PMNs that were adherent to the apical epithelial surface (D) were quantified by MPO assay. Data depict means ± SE (n = 3). (E) Confluent T84 monolayers were treated apically with (closed circle) or without (open circle) 10 μg/ml NS 19-9 before the addition of 1 × 106 PMNs. PMN transmigration was then measured at the indicated time points. Data are mean ± SE (n = 3). (F) Confluent T84 monolayers were costained with 10 μg/ml anti-Occludin mAb and 10 μg/ml Dupan-2, and analyzed by confocal microscopy. Original magnification ×40. (G) Confluent T84 monolayers were pretreated with 10 μg/ml Dupan-2 or 10 μg/ml noninhibitory IgG isotype control mAb before 1 × 106 PMNs were added to the basolateral surface. PMNs were allowed to migrate for 1 h in response to a 100-nM gradient of fMLF. The numbers of migrated PMNs were quantified by MPO assay. Data are means ± SE (n = 3). A total of 1 × 106 PMNs was added to confluent T84 monolayers treated apically with 10 μg/ml binding control IgG1 (H) or 10 μg/ml NS19-9 (I). PMNs were allowed to migrate in the basolateral-to-apical direction in response to a 100-nM gradient of fMLF. At the time points indicated, the T84-containing filters were removed, and the solution from the apical migration reservoir was assayed for sCD44v6 by ELISA. (J) Addition of mAb NS19-9 to the apical migration reservoir after PMN TEM does not prevent binding of released CD44v6 to the capture or detection ELISA mAbs. Significance was defined as p < 0.05 (*p < 0.05, **p < 0.01, ***p < 0.001). Next, we examined the functional effects of mAbs specific for either sLea (NS19-9) or sLec (Dupan-2) on PMN TEM. Apical treatment of T84 IECs with NS19-9 significantly inhibited PMN TEM, relative either to control IECs treated without Ab (p < 0.01) or to those treated apically with a noninhibitory IgG binding control Ab (p < 0.01; Fig. 2C). Furthermore, the reduction in PMN TEM was associated with a significant increase in the numbers of PMN that had crossed through tight junctions yet remained adherent to the apical surface of the epithelium (Fig. 2D). Thus, the arrest in TEM occurred at the level of detachment from the apical epithelial membrane, as we have previously reported for GM35-mediated blockade of PMN TEM (12). Analysis of the kinetics of the effects of NS19-9 revealed consistent inhibition of migration over a 3-h time course (Fig. 2E). Although immunofluorescent analysis of the subcellular localization of sLec on T84 IECs demonstrated low levels of apical expression of this carbohydrate structure (Fig. 2F), this anti-sLec mAb had no effect on PMN TEM across T84 IECs (Fig. 2G), indicating that the carbohydrate determinants that regulate intestinal trafficking of PMN are highly specific. Given our prior findings that ligation of the GM35 ligand inhibits PMN TEM by blocking shedding of CD44v6, we next explored the effect of NS19-9–dependent masking of the sLea glycoepitope on PMN TEM-dependent cleavage of CD44v6. ELISA-based detection of sCD44v6 ECD in the apical supernatants from T84 IECs after PMN TEM (Fig. 2H) confirmed our previous findings that significant levels of CD44v6 were released from T84 IECs between 30 and 60 min of PMN TEM (12). Furthermore, binding of NS19-9 to epithelial sLea blocked the release of CD44v6 (Fig. 2I). In contrast with the effects seen when NS19-9 is present for the duration of the migration assay, addition of mAbs against sLea after completion of PMN migration did not prevent the detection of shed CD44v6 (Fig. 2J). These data demonstrate that NS19-9 (and GM35, data not shown) do not prevent binding of released CD44v6 to the capture or detection Abs of the ELISA, but rather that binding of mAbs to sLea interferes with the release of epithelial CD44v6. NS19-9 was next used to confirm that the sLea expressed by T84 and HT29 IECs was displayed on an O-linked carbohydrate backbone. Indeed, treatment of T84 and HT29 IECs with benzyl-GalNAc, but not tunicamycin, reduced recognition of the sLea carbohydrate epitope by mAb NS19-9 (Fig. 3A, 3B). In addition, pretreatment of IEC protein lysates with neuraminidase ablated binding of the anti-sLea mAb NS19-9 to its O-linked carbohydrate epitope (Fig. 3C), demonstrating that the negatively charged sialic acid residue is again critical for Ab-mediated recognition of sLea. NS19-9 and GM35 bind to O-linked sLea. T84 or HT29 IECs were pretreated with (A) 5 μg/ml tunicamycin or (B) 4 mM benzyl-GalNAc before whole-cell lysis and Western blotting with NS19-9. (C) Protein lysates isolated from T84 IECs were treated with neuraminidase before immunoblotting with NS19-9. (D) Representative immunoblot demonstrating that transfection of HT29 IECs with CD44 gene silencing plasmids (shRNA1-3) decreased the expression of sLea detected by NS19-9 as compared with scrambled control. Data depict representative results from n = 3 immunoblots. MALDI-TOF/TOF spectrometric analysis of the O-linked (E) and N-linked (F) derivatized and permethylated glycans isolated from T84 IECs. Given that GM35 was initially characterized as binding to the transmembrane glycoprotein CD44v6 (12), the relative contribution of CD44-specific-sLea to total detected levels of sLea was next assessed. shRNA-based attenuation of CD44 expression was performed in the readily transfectable, sLea expressing HT29 IECs. As we have reported previously for the GM35 Ag (12), knockdown of CD44v6 protein expression in HT29 IECs by shRNA plasmids (data not shown) also corresponded to a significant reduction in the expression of sLea as detected by NS19-9 (Fig. 3D). We next used glycomic analyses to gain a broader understanding of the global similarities and differences in glycosylation patterns across IEC lines to further define the structure of sLea-containing glycans on T84 IECs, as well as to identify candidate mechanisms for differential regulation of sLea synthesis. Analysis of N- and O-glycans released from T84 IECs using MALDI-TOF MS revealed that O-glycans from T84 IECs have compositions dominated by predicted core 1 (mass to charge ratio [m/z] 1256.5 and 895.2) and core 2 structures (m/z 983.4, 1344.4, and 1705.6; Fig. 3E). Also included among the predicted O-glycans are several higher m.w. extended core 2 structures (m/z 1879.9, 2329.0, and 2503.1). Importantly, analysis of the O-glycan profile from T84 IECs revealed numerous sialyl Lewis moieties on these core 2 and extended core 2 structures (m/z 1518.6, 1879.8, 1967.8, 2141.9, 2329.0, and 2503.1). Whereas MS by this approach cannot distinguish between the structural isomers sLea and sLex, our biochemical analyses of the sLea binding mAbs GM35 and NS19-9, as well as the anti-sLex mAb CD15s (data not shown), make it likely that the sialyl Lewis structures detected in this study are sLea. Notably, surface glycan profiling also indicated that the sLec structures on T84 IECs are confined to N-glycans (Fig. 3F). In contrast with the extensive glycosylation of T84 IECs, the O-glycans released from SKCO15 (Supplemental Fig. 2A, 2B) were much less complex, and Caco2 (Supplemental Fig. 2C, 2D) IECs had decreased structural complexity of both N- and O-glycans. Thus, in addition to differences in sLea expression, these IEC lines also revealed more global differences in total N- and O-glycosylation. Furthermore, there were no sialyl Lewis structures of any kind displayed by either the N- or O-glycans from SKCO15 IECs. MS analysis of the glycans displayed by Caco2 IECs did reveal low levels of expression of a small number of predicted sialyl Lewis structures (m/z 1519, 1880.4). However, given the lack of GM35 (12) and NS19-9 binding (Fig. 2A) to Caco2 IECs, and the positive binding of the anti-sLex mAb CD15s to Caco2 lysates by immunoblot (data not shown), these sialylated Lewis Ag structures detected by MALDI-TOF are most likely to be sLex rather than sLea. To further characterize the sLea-containing glycans displayed by T84 IECs, MS/MS analysis of the O-glycans was performed through collision-induced-dissociation (CID), demonstrating that the six O-linked sialyl Lewis-containing glycans on T84 IECs are core 2 structures (Supplemental Fig. 3A–F). MALDI-TOF MS analysis also revealed that the N-glycans from T84 IECs are mainly composed of high mannose-type glycans, ranging from Man5GlcNAc2 to Man9GlcNAc2 (m/z 1579.8, 1784.0, 1988.1, 2192.2 and 2396.3) with minor biantennary (m/z 2605.6) or triantennary (m/z 3590.0) complex-type structures (m/z 2605.6, 3590.0; Fig. 3F). Importantly, analysis of the N-glycans from T84 IECs revealed no expression of any sialyl Lewis structures. Therefore, the combined results of immunoblot and MS demonstrate that the sLea Ag in T84 IECs is found only on core 2 or extended core 2 O-glycans. MS analyses revealed global differences in the extent and complexity of glycosylation across IECs, and that sLea is confined to core 2 O-glycans. sLea synthesis is also likely to be regulated, at least in part, by enzymes directly implicated in the biosynthesis of the family of sialylated Lewis structures. Therefore, the differential expression of glycosyltransferases with potential roles in sLea synthesis (Fig. 4A), including fucosyl and sialyltransferases, was examined in IEC lines, which either expressed both CD44v6 and sLea (T84 and HT29), expressed CD44v6 but not sLea (SKCO15), or expressed neither CD44v6 nor sLea (Caco2). Differential expression of glycosyltransferases in human IECs. (A) Schematic representation of the glycosyltransferases responsible for the biosynthesis of sLea. (B) RNA was isolated from indicated IECs and analyzed by real-time PCR for levels of expression of ST3Gal3, Fut3, and Fut6. Results are depicted as fold change relative to Caco2 IECs and normalized for expression of the housekeeping gene GAPDH. n = 3–6. Significance was defined at p < 0.05 (*p < 0.05, **p < 0.01). (C) After epithelial cell lysis, equal amounts of protein lysates from indicated IECs were subjected to SDS-PAGE under reducing conditions and immunoblotted with indicated Abs. Data represent n = 3 immunoblots. Comparison of the RNA levels of specific fucosyltransferases revealed that Fut3 expression was increased ∼75-fold in T84 IECs, relative to SKCO15 and Caco2 (p < 0.01; Fig. 4B). Although considered to be an α1-3/4 fucosyltransferase, the Fut3 enzyme is predominantly known to exhibit α1-4 fucosyltransferase activity (46, 47). In addition to changes in Fut3 expression, a 7-fold increase in the expression of α1/3 fucosyltransferase 6 (Fut6) was also observed in T84 relative to Caco2 IECs (p < 0.05), but not relative to SKCO15 cells (Fig. 4B). However, Fut6 has previously been implicated in the generation of sLex, but not sLea (46). No other significant differences were observed for the expression of the additional fucosyltransferases examined (Supplemental Fig. 4C). The expression levels of ST3Gal sialyltransferases, which catalyze the addition of Neu5Ac to Gal during sLea synthesis, were also examined. Results demonstrate the expression of α2/3 sialyltransferase 3 (ST3Gal3), which has been shown to be important for sLea synthesis in other cells (46), was significantly lower in T84 cells relative to Caco2 and SKCO15 cells. Thus, another sialyltransferase such as α2/3-ST3Gal2 may be involved in sLea biosynthesis in T84 IECs (Fig. 4B). No other significant differences in the expression of ST3Gal sialyl transferases were observed (Supplemental Fig. 4B). Observed differences in ST3Gal3 and Fut3 gene expression were subsequently confirmed at the level of protein expression in that T84 IEC lysates revealed increases in Fut3 (Fig. 4C) and lower ST3Gal3 protein expression relative to SKCO15 and Caco-2 IECs. A plasmid containing full-length Fut3, which naturally has both α1,3- and α1,4-fucosyltransferase activities, was transfected into sLea-deficient SKCO15 cells to determine whether the observed lack of Fut3 expression was truly related to the absence of sLea in specific IEC lines. Indeed, transfection with Fut3 resulted in robust expression of this fucosyltransferase relative to SKCO15 cells transfected with an empty vector (Fig. 5A). In addition, overexpression of Fut3 protein correlated with the expression of a large glycoprotein that was detected with GM35 (Fig. 5A) and NS19-9 (data not shown), suggesting that Fut3 expression can drive sLea biosynthesis in these IECs. To further demonstrate the importance of Fut3 synthesis for sLea generation in human IECs, we knocked down expression of Fut3 in HT29 IECs. Transfection with Fut3 siRNA decreased Fut3 protein expression and corresponded to a decrease in sLea expression detected by GM35 or NS19-9 (data not shown), relative to nontransfected HT29 IECs and to cells transfected with Scr siRNA (Fig. 5B). Fut3 drives sLea expression in SKCO15 IECs, but not on CD44v6. (A) SKCO15 IECs transfected with empty vector or Fut3 containing vector were immunoblotted with indicated Abs. Data represent n = 3 immunoblots. (B) HT29 IECs either nontransfected or transfected with Scr or Fut3 siRNA were lysed and immunoblotted with Abs against Fut3 and sLea. (C) Nontransfected SKCO15 IECs and SKCO15 IECs transfected with Fut3 or an empty vector were grown as confluent inverted monolayers. Monolayers were pretreated apically with 10 μg/ml GM35 mAb before 1 × 106 PMNs were added to the basolateral surface. PMNs were allowed to migrate for 1 h in response to a 100-nM gradient of fMLF. The number of migrated PMNs was quantified by MPO assay. (D) Confluent Fut3 transfected/sLea-expressing SKCO15 monolayers were costained with 10 μg/ml GM35 (red) and 10 μg/ml anti-CD44v6 mAb (green). Apical protein localization was determined by confocal microscopy analysis. Representative images from n = 3 experiments are shown en face or in the xz plane of section. The effects of mAb GM35 on PMN TEM across Fut3/sLea-expressing SKCO15 IECs were assessed next. Despite successful induction of both Fut3 and sLea expression, mAb GM35 had no effect on PMN trafficking across sLea-expressing SKCO15 cells (Fig. 5C). However, immunofluorescence analysis of the expression of surface epitopes in these transfected IECs revealed little to no colocalization of sLea and CD44v6 (Fig. 5D). This suggests that although Fut3 expression does drive sLea synthesis in SKCO15 IECs, these cells lack other intracellular processes necessary for the posttranslational glycosylation/decoration of CD44v6 with sLea. Thus, GM35 appears to mediate its functional effects on PMN TEM through engagement of the glycan sLea specifically when this glycoepitope is present on the epithelial protein CD44v6. Further demonstration of the role of sLea decorated CD44v6 in regulating PMN detachment from the apical epithelial surface was assessed through comparison of the cellular localization of sLea relative to its structural isomer sLex and the glycoprotein CD44v6. Confocal microscopic analysis of immunofluorescently stained, nonpermeabilized T84 IEC monolayers revealed that GM35 binds specifically to sLea on apically expressed CD44v6 (Fig. 6A). Furthermore, immunofluorescence and immunohistochemical analyses of colonic mucosa from individuals with UC reveal increased expression of sLea in inflamed tissue versus noninvolved regions from the same patient (Fig. 6B, 6C), indicating that the expression of sLea on intestinal epithelial CD44v6 is physiologically relevant to human intestinal inflammation. Furthermore, immunohistochemical analysis of colonic tissue from individuals with UC revealed GM35 staining of material accumulated within the intestinal crypt, consistent with our in vitro results indicating PMN-dependent shedding of sLea-containing CD44v6 during PMN TEM (Fig. 6C, red arrow). In addition, costaining of inflamed UC colonic tissue for CD44v6 and sLea revealed strong colocalization of these molecules (Fig. 6D), demonstrating the localization of the sLea glycan to apically expressed epithelial CD44v6 in inflamed human mucosa. NS19-9 and GM35 bind to apical sLea on CD44v6 in inflamed colonic mucosa. Confluent T84 monolayers were costained with 10 μg/ml NS19-9 (green) and 10 μg/ml GM35, 10 μg/ml anti-CD44v6 mAb, or 10 μg/ml anti-sLex mAb (red). Apical protein localization was determined by confocal microscopy analysis. Representative images from n = 3 experiments are shown en face or in the xz plane of section. Original magnification ×40 (A). Cryosections of noninflamed colonic mucosa and inflamed sections of colonic mucosa from patients with active UC were examined for localization of sLea (NS19-9, green) and the epithelial marker Desmoglein 1 (red) as described in Materials and Methods. Original magnification ×40 (B). (C) Immunohistochemical analysis of colonic epithelia from a patient with UC was performed using the anti-sLea mAb GM35 (brown). Noninvolved uninflamed epithelium is compared with active inflammation within crypt abscesses. Original magnification ×40. (D) Cryosections of inflamed colonic mucosa from patients with active UC were examined for colocalization of sLea (GM35, green) and CD44v6 (red) as described in Materials and Methods. Original magnification ×40. Having previously demonstrated a role for GM35 in the prevention of PMN TEM in vitro, we sought to determine whether these findings could be extended into a murine in vivo model of intestinal inflammation. Epithelial cell preparations from small and large intestines of adult C57BL/6J mice were found to express a glycoprotein recognized by Western blot by GM35 (Fig. 7A). Furthermore, this glycoprotein was of comparable molecular mass with mouse CD44v6 (∼200 kDa). However, in contrast with human tissues, there was robust basal expression of both CD44v6 and the GM35 epitope in murine small and large intestinal epithelia in the absence of exogenous inflammatory stimuli (Fig. 6B, 6C). 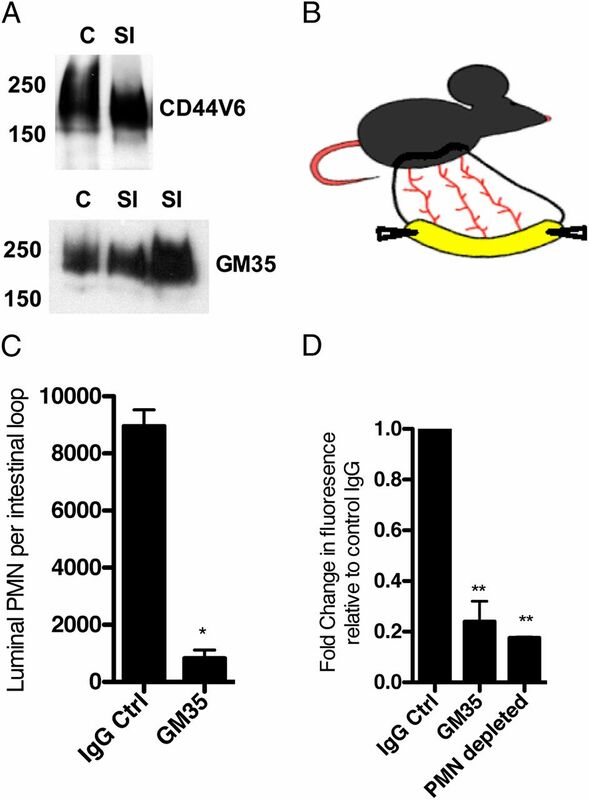 GM35 blocks PMN luminal trafficking in vivo. (A) After epithelial cell isolation from the small intestine and colon of WT C57BL/6J mice, equal amounts of protein lysates were subjected to SDS-PAGE under reducing conditions and immunoblotted with indicated Abs. Data represent n = 3 immunoblots. (B) Cartoon demonstrating exteriorization of vascularized small intestinal loop in C57BL/6J mouse. (C) A total of 100 μM fMLF along with 50 μg GM35 or IgG control mAb was injected into the lumen of a surgically isolated fully vascularized segment of murine small intestine. After a 90-min incubation, PMNs that migrated into the intestinal lumen were quantified by cytospin and Diff-Quik staining. (D) Following sequential injection of 100 μM fMLF ± 50 μg indicated mAb and 10 kDa FITC dextran into the small intestine of WT C57BL/6J mice with normal PMN levels and mice pretreated with anti-Ly6G mAb to deplete PMN, passage of dextran across the intestinal epithelium was measured by quantification of fluorescence in the peripheral blood. Data are representative of experiments performed on n = 3 mice. *p < 0.05, **p < 0.01. The presence of a GM35-binding glycoprotein in murine intestine supported further investigations of the physiologic relevance of the functional effects of GM35 in mouse intestine. Initially, it was verified that injection of exogenous chemoattractant into a closed externalized loop of small intestine from an anesthetized mouse would, within 60 min, result in quantifiable migration of PMNs into the intestinal lumen (model in Fig. 7B, 7C). In the absence of exogenous chemoattractant, PMNs were not detected within the intestinal lumen. However, injection of either fMLF (100 μM) or the murine cytokine KC resulted in a significant influx of PMNs. Importantly, coinjection of GM35 along with fMLF resulted in a significant decrease in the number of PMNs reaching the intestinal lumen, relative to those treated with fMLF and an isotype control mAb (Fig. 7C). It has previously been shown that PMN infiltration into intestinal tissues disrupts intestinal barrier function (48). Therefore, we examined whether GM35-dependent blockade of PMN TEM would alter barrier function in this model. Isolated small intestinal loops were injected intraluminally with fMLF, in the presence of either GM35 or an isotype-matched IgG control mAb, and PMN migration was allowed to proceed for 60 min. These same loops were then injected with 10 kDa FITC-conjugated dextran and incubated for an additional 30 min. At this time, mice were sacrificed and intestinal permeability was quantified by measurement of fluorescence of the peripheral blood. PMN migration into the intestinal lumen was indeed accompanied by increased intestinal permeability to 10 kDa FITC dextran (Fig. 7D). Furthermore, this increase in permeability was prevented by either mAb GM35 or by systemic neutrophil depletion, using an antiLy6G mAb (200 μg i.p., 24 h before the experiment; Fig. 7D). Thus, luminal GM35 blocked both chemoattractant-stimulated PMN TEM and associated increases in permeability in murine small intestine. Controlled PMN TEM is an essential component of the innate immune response against invading microorganisms. However, dysregulated influx of PMNs across the intestinal epithelium results in the formation of crypt abscesses and is indicative of IBD. PMN accumulation at epithelial surfaces is also relevant to other inflammatory processes including periodontitis, cystitis, and infectious enterocolitis (49). Therefore, a greater understanding of the mechanisms governing the late stages of PMN TEM, including PMN detachment from the apical epithelium, may provide new and unique therapeutic targets for regulating mucosal inflammation. Using the unique mAb GM35, we have recently demonstrated that shedding of the ECD of CD44v6 is associated with PMN detachment from the apical epithelial surface. In this study, we extend these findings to identify a novel role for the sialylated glycan sLea displayed by the epithelial protein CD44v6 in the regulation of the interaction between migrating PMN and the apical aspect of the intestinal epithelium. Immunoblotting and MS analyses revealed that sLea on CD44v6 is exclusively O-linked and independent of N-glycosylation. These results are consistent with evidence that most variant exons of CD44, including CD44v6, are primarily O-glycosylated (13, 50, 51), with only two alternative exons (CD44v5 and CD44v10) containing NXS/T, the motif for N-glycosylation (13). Furthermore, many of the O-glycans attached to CD44 variant glycoproteins terminate with sialic acid residues (50), consistent with the results of this study revealing that the sialic acid is essential for GM35 ligand binding. Expansion of these findings using glycan array analysis technology identified the highest affinity glycotope recognized by GM35 as the sialic acid–containing glycan determinant sLea. Lower affinity binding to sLec, the nonfucosylated biosynthetic precursor of sLea, was also detected. However, sLec localized exclusively to N-linked glycans at the apical surface of T84 IECs and an mAb to anti-sLec (Dupan-2) had no functional effect on PMN TEM. Furthermore, expression of sLec has been previously associated primarily with the large transmembrane glycoprotein Muc-1 (52, 53) and not with CD44v6. The glycans of glycoproteins, including CD44, are known to serve as ligands in recognition systems particularly in inflammation and immunity (54, 55), and glycans displayed by cell-surface glycoproteins have been shown to play an important role in the regulation of leukocyte trafficking (56). Interestingly, leukocyte expressed N-linked glycans are known to act as ligands for E-selectin. In addition, neutrophil core 1–derived O-glycans can also function to bind E-selectin (57). Furthermore, loss of IEC-specific core 1–derived O-glycans is associated with spontaneous colitis in mice (58). In this study, we identify a novel role for an sLea-containing core 2 glycan in PMN–epithelial interactions in the intestine. In further support of a role for sLea in modulating events at the apical epithelial surface of the intestine during inflammation, this tetrasaccharide determinant, first described by Koprowski et al. (38), has previously been reported to be highly expressed on the surface of established human pancreatic, colon, and gastric cancer cell lines in vitro (59, 60), as well as in human adenocarcinomas of the colon, stomach, gall bladder, and pancreas (38, 61, 62). Whereas sLea itself has previously been reported to act as an important mediator of cell–cell adhesion (63), to our knowledge, our studies of PMN TEM represent the first report of a role for this carbohydrate Ag in the regulation of PMN trafficking. Specifically, we demonstrate that sLea on CD44v6 can be targeted to significantly inhibit PMN TEM through inhibition of cleavage of CD44v6 and the detachment of PMN from the luminal epithelial surface. These findings identify a novel, glycan-dependent mechanism for the regulation of PMN TEM and provide the first evidence, to our knowledge, of a functional role for sLea in mucosal inflammation. We discovered in our study, an epithelial cell–specific expression pattern for sLea, with robust expression observed in T84 and HT29, but not Caco2 or SKCO15 IECs. This restricted pattern of expression for sLea was further confirmed by MS mapping of the surface glycans expressed by each of the IEC lines examined in this study. 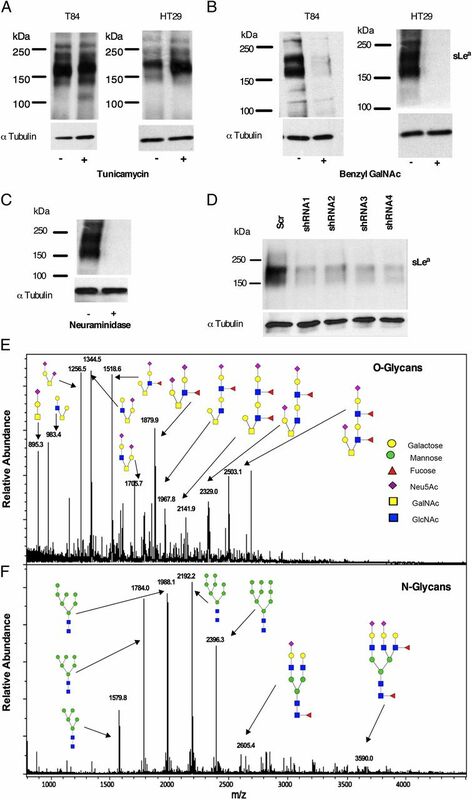 This cell-specific expression pattern for sLea was exploited to identify specific glycosyltransferases involved in the biosynthesis of sLea in human IECs. Comparative analysis of galactosyl, sialyl, and fucosyl transferase expression in sLea-expressing (T84 and HT29) and sLea nonexpressing (Caco2 and SKCO15) IECs demonstrated numerous differences relevant to the biosynthesis of this inflammation-responsive sLea determinant. Most significantly, expression levels of the fucosyltransferases revealed a profound increase in the expression of α3/4 Fut3 in T84 IECs relative to SKCO15 and Caco2 IECs. The absence of α3/4 Fut3 in SKCO15 IECs correlates with the lack of expression of fucosylated Lewis structures observed by MS characterization of the SKCO15 glycan profile. In support of the role of Fut3 in the generation of the GM35 Ag sLea in human IECs, Fut3 predominantly exhibits α1-4 fucosyltransferase activity and has previously been implicated in the synthesis of sLea in other systems (46, 47). Further, it has also been previously reported that α1-3 fucosyltransferases catalyze the final step in the synthesis of a range of glycoconjugates known to be involved in cell adhesion and lymphocyte recirculation (47). Thus, differing levels of sLea synthesis are likely to be due, in part, to the massive differences in Fut3 protein expression seen across IECs. In support of this, transfection of Fut3 into SKCO15 IECs induced a robust expression of the sLea glycoepitope. However, despite successful forced expression of sLea in these Fut3-expressing SKCO15 cells, GM35 did not block PMN TEM across these transfected IECs. This lack of a functional effect of GM35 in these sLea-expressing SKCO15 IECs was attributed to the observation that although these cells synthesized sLea, this glycoepitope was not displayed on CD44v6, further underscoring the importance of the role of this epithelial glycoprotein in regulating PMN TEM. These findings also emphasize the physiologic relevance of sLea on CD44v6 to intestinal inflammation. sLea is upregulated in concert with CD44v6 in inflamed regions of human colon from patients with UC. Furthermore, luminal injection of GM35 blocks PMN TEM in vivo. This blockade of PMN TEM is associated with preservation of intestinal barrier function, normally compromised by PMN TEM. Therefore, it is highly likely that future identification of both the specific GM35 binding glycan determinant (either sLea or sLec) and the associated protein ligand in murine intestinal tissues, as well as further characterization of the novel glycan profile of normal and inflamed murine intestinal epithelium, will provide useful targets for future therapeutics in IBD. Given that expression of both CD44v6 (12) and the sLea determinant are upregulated in the intestinal crypts of patients with UC, this novel glycosylation-dependent interaction is a promising potential target for therapeutic intervention in IBD. We thank Drs. Miao and Rong Jiang from the Department of Human Genetics at Emory University for help with MS/MS analysis. We thank Tony Liang for assistance with design of initial deglycosylation experiments. We also thank Drs. Maria Delgado and Brad Farris from the Department of Pathology and Laboratory Medicine at Emory University for expert help with the immunohistochemical staining of human intestinal mucosa samples. This work was supported by National Institutes of Health Grants DK079392 and DK072564 (to C.A.P. ), R01DK089763 and R01DK055679 (to A.N. ), R24GM098791 and U01CA168930 (to R.D.C. ), and U54GM062116 (Consortium for Functional Glycomics); a seed grant from the Emory University Research Council (to N.A.L. ); and Career Development (to J.C.B.) and Senior Research awards from the Crohn’s & Colitis Foundation of America (to N.A.L.).
. 2007. Unravelling the pathogenesis of inflammatory bowel disease. Nature 448: 427–434.
. 2013. The role of polymorphonuclear leukocyte trafficking in the perpetuation of inflammation during inflammatory bowel disease. Inflamm. Bowel Dis. 19: 1556–1565.
. 2009. Endothelial cell activation leads to neutrophil transmigration as supported by the sequential roles of ICAM-2, JAM-A, and PECAM-1. Blood 113: 6246–6257.
. 2007. Getting to the site of inflammation: the leukocyte adhesion cascade updated. Nat. Rev. Immunol. 7: 678–689.
. 1997. Basic mechanism of leukocyte migration. Horm. Metab. Res. 29: 614–621.
. 2004. Neutrophils migrate across intestinal epithelium using beta2 integrin (CD11b/CD18)-independent mechanisms. Clin. Exp. Immunol. 136: 262–268.
. 1996. Expression and polarization of intercellular adhesion molecule-1 on human intestinal epithelia: consequences for CD11b/CD18-mediated interactions with neutrophils. Mol. Med. 2: 489–505.
. 1996. CD47 mediates post-adhesive events required for neutrophil migration across polarized intestinal epithelia. J. Cell Biol. 132: 437–450.
. 2001. Neutrophil transepithelial migration: regulation at the apical epithelial surface by Fc-mediated events. Am. J. Physiol. Gastrointest. Liver Physiol. 280: G746–G754.
. 2009. The heparan sulfate proteoglycan form of epithelial CD44v3 serves as a CD11b/CD18 counter-receptor during polymorphonuclear leukocyte transepithelial migration. J. Biol. Chem. 284: 3768–3776.
. 2010. 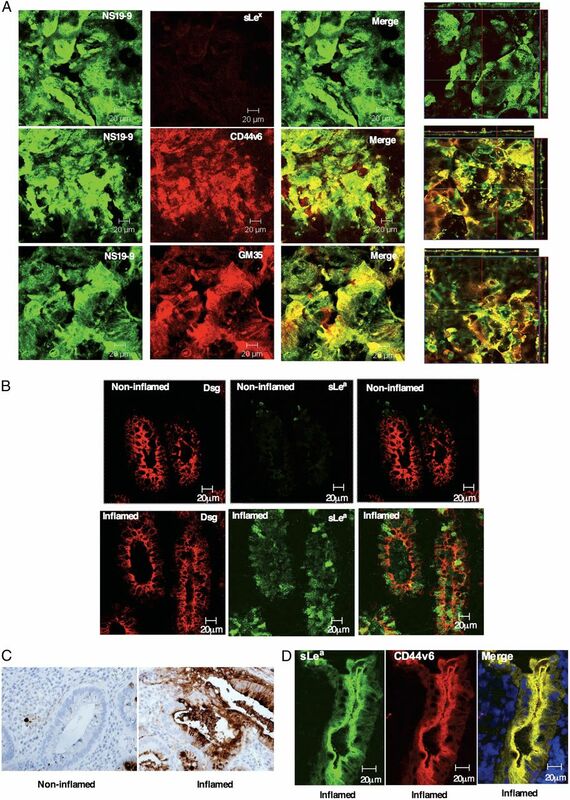 Neutrophil migration across intestinal epithelium: evidence for a role of CD44 in regulating detachment of migrating cells from the luminal surface. J. Immunol. 185: 7026–7036.
. 1992. Genomic structure of DNA encoding the lymphocyte homing receptor CD44 reveals at least 12 alternatively spliced exons. Proc. Natl. Acad. Sci. USA 89: 12160–12164.
. 1990. Expression of CD44 confers a new adhesive phenotype on transfected cells. Cell 60: 45–52.
. 1992. CD44H regulates tumor cell migration on hyaluronate-coated substrate. J. Cell Biol. 118: 971–977.
. 1990. CD44 is the principal cell surface receptor for hyaluronate. Cell 61: 1303–1313.
. 1999. CD44 cleavage induced by a membrane-associated metalloprotease plays a critical role in tumor cell migration. Oncogene 18: 1435–1446.
. 1998. How tumor cells make use of CD44. Cell Adhes. Commun. 6: 141–147.
. 1991. A new variant of glycoprotein CD44 confers metastatic potential to rat carcinoma cells. Cell 65: 13–24.
. 2000. A role for the cell adhesion molecule CD44 and sulfation in leukocyte-endothelial cell adhesion during an inflammatory response? Biochem. Pharmacol. 59: 455–465.
. 2003. CD44: from adhesion molecules to signalling regulators. Nat. Rev. Mol. Cell Biol. 4: 33–45.
. 1993. Splicing choice from ten variant exons establishes CD44 variability. Nucleic Acids Res. 21: 1225–1229.
. 1991. Human keratinocytes express a new CD44 core protein (CD44E) as a heparan-sulfate intrinsic membrane proteoglycan with additional exons. J. Cell Biol. 113: 207–221.
. 1992. Lymphocyte CD44 binds the COOH-terminal heparin-binding domain of fibronectin. J. Cell Biol. 116: 817–825.
. 1991. Neutrophil migration across a cultured intestinal epithelium. Dependence on a CD11b/CD18-mediated event and enhanced efficiency in physiological direction. J. Clin. Invest. 88: 1605–1612.
. 2004. Involvement of the junctional adhesion molecule-1 (JAM1) homodimer interface in regulation of epithelial barrier function. J. Biol. Chem. 279: 16254–16262.
. 1998. Functional mapping of CD11b/CD18 epitopes important in neutrophil-epithelial interactions: a central role of the I domain. J. Immunol. 160: 5058–5065.
. 2001. CD18 dependency of transendothelial neutrophil migration differs during acute pulmonary inflammation. J. Immunol. 167: 2839–2846.
. 1995. Receptors involved in carbohydrate binding modulate intestinal epithelial-neutrophil interactions. J. Biol. Chem. 270: 10531–10539.
. 1993. Neutrophil migration across cultured intestinal epithelial monolayers is modulated by epithelial exposure to IFN-gamma in a highly polarized fashion. J. Cell Biol. 120: 785–798.
. 2008. Production of type VI collagen by human macrophages: a new dimension in macrophage functional heterogeneity. J. Immunol. 180: 5707–5719.
. 2008. Use of Ly6G-specific monoclonal antibody to deplete neutrophils in mice. J. Leukoc. Biol. 83: 64–70. Brockhausen, I., H. Schachter, and P. Stanley. 2009. O-GalNAc Glycans. In Essentials of Glycobiology, 2nd Ed. A. Varki, R. D. Cummings, J. D. Esko, H. H. Freeze, P. Stanley, C. R. Bertozzi, et al., eds. Cold Spring Harbor Laboratory Press, Cold Spring Harbor, NY, p. 115–128.
. 2010. Extensive enrichment of N-glycolylneuraminic acid in extracellular sialoglycoproteins abundantly synthesized and secreted by human cancer cells. Glycobiology 20: 752–762.
. 2003. Glycosylation of human pancreatic ribonuclease: differences between normal and tumor states. Glycobiology 13: 227–244.
. 1979. Colorectal carcinoma antigens detected by hybridoma antibodies. Somatic Cell Genet. 5: 957–971.
. 2010. Alterations in glycosylation as biomarkers for cancer detection. J. Clin. Pathol. 63: 322–329.
. 2011. Evolution of CD33-related siglecs: regulating host immune functions and escaping pathogen exploitation? Immunology 132: 18–26.
. 2005. Siglec-9 transduces apoptotic and nonapoptotic death signals into neutrophils depending on the proinflammatory cytokine environment. Blood 106: 1423–1431.
. 2003. Characterization of Siglec-5 (CD170) expression and functional activity of anti-Siglec-5 antibodies on human phagocytes. Exp. Hematol. 31: 382–388.
. 2006. Peanut lectin stimulates proliferation of colon cancer cells by interaction with glycosylated CD44v6 isoforms and consequential activation of c-Met and MAPK: functional implications for disease-associated glycosylation changes. Glycobiology 16: 594–601.
. 2010. In vivo tumor cell adhesion in the pulmonary microvasculature is exclusively mediated by tumor cell–endothelial cell interaction. BMC Cancer 10: 177.
. 2002. Cyclooxygenase-2 activity altered the cell-surface carbohydrate antigens on colon cancer cells and enhanced liver metastasis. Cancer Res. 62: 1567–1572.
. 2010. Differential expression of alpha-2,3-sialyltransferases and alpha-1,3/4-fucosyltransferases regulates the levels of sialyl Lewis a and sialyl Lewis x in gastrointestinal carcinoma cells. Int. J. Biochem. Cell Biol. 42: 80–89.
. 2001. Fucosyltransferases: structure/function studies. Glycobiology 11: 119R–128R. 1994. Migration of neutrophils through epithelial monolayers. Trends Cell Biol. 4: 4–7.
. 2000. Neutrophil migration across intestinal epithelium. Ann. N. Y. Acad. Sci. 915: 151–161.
. 1995. Proteoglycan forms of the lymphocyte homing receptor CD44 are alternatively spliced variants containing the v3 exon. J. Cell Biol. 128: 673–685.
. 1991. Post-translational protein modification and expression of ankyrin-binding site(s) in GP85 (Pgp-1/CD44) and its biosynthetic precursors during T-lymphoma membrane biosynthesis. J. Biol. Chem. 266: 17983–17989.
. 2000. Restoration of alpha(1,2) fucosyltransferase activity decreases adhesive and metastatic properties of human pancreatic cancer cells. Cancer Res. 60: 1449–1456.
. 1987. Molecular characterization of a mucin-type antigen associated with human pancreatic cancer. The DU-PAN-2 antigen. J. Biol. Chem. 262: 12863–12870. 1997. Selectin-carbohydrate interactions during inflammation and metastasis. Glycoconj. J. 14: 585–591.
. 1996. Carbohydrate recognition systems: functional triads in cell-cell interactions. Curr. Opin. Struct. Biol. 6: 679–691.
. 2009. Glycosylation in immune cell trafficking. Immunol. Rev. 230: 97–113.
. 2010. Core 1-derived O-glycans are essential E-selectin ligands on neutrophils. Proc. Natl. Acad. Sci. USA 107: 9204–9209.
. 2011. Loss of intestinal core 1-derived O-glycans causes spontaneous colitis in mice. J. Clin. Invest. 121: 1657–1666.
. 1983. Mass spectrometry of a human tumor glycolipid antigen being defined by mouse monoclonal antibody NS-19-9. Biochem. Biophys. Res. Commun. 110: 383–391.
. 1982. A monoclonal antibody-defined antigen associated with gastrointestinal cancer is a ganglioside containing sialylated lacto-N-fucopentaose II. J. Biol. Chem. 257: 14365–14369.
. 1982. Gastrointestinal cancer-associated antigen in immunoperoxidase assay. Cancer Res. 42: 4820–4823.
. 1989. Expression of Lewisa, Lewisb, Lewisx, Lewisy, siayl-Lewisa, and sialyl-Lewisx blood group antigens in human gastric carcinoma and in normal gastric tissue. Cancer Res. 49: 745–752.
. 1993. Contribution of carbohydrate antigens sialyl Lewis A and sialyl Lewis X to adhesion of human cancer cells to vascular endothelium. Cancer Res. 53: 354–361.